Face It! It’s time to do some face-to-face marketing! 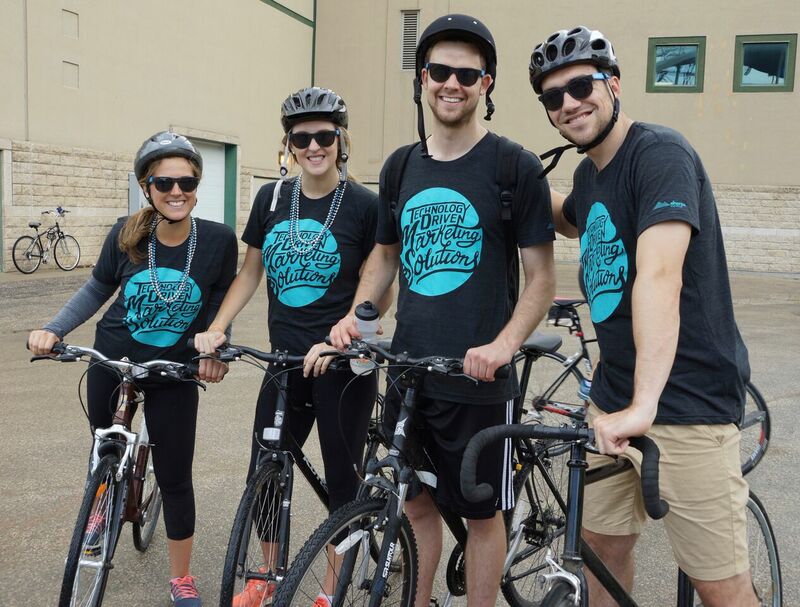 Sherpa recently sent a social media engagement team to the 2015 Riverview Health Centre Foundation’s (RHCF) Cycle on Life event, a scenic bike ride, which takes place in the South End of Winnipeg and raises money for upgrades to RHC’s Alzheimer’s and Dementia care units. Sherpa is tasked with managing RHCF’s social media channels, and thus, promoting the Cycle on Life through these outlets. By posting engaging content and connecting with influencers in the community, Sherpa has helped raise the profile of both the foundation and the Cycle on Life event itself – stay tuned for a blog post highlighting these strategies and results! Although these social media efforts have been effective, in today’s technology driven world it is sometimes easy to forget about the value of connecting with your target market in person. Sherpa chose to compliment this strong social media presence with a personal touch by sending a social media engagement team to run a booth and participate in the Cycle on Life event. The team handed out stylish sunglasses with the RHCF Facebook page name and Twitter handle written on the arms to draw further attention to the social media platforms, and engaged with the riders taking part in the event. In person, the team was able connect with individuals directly, bringing awareness to the value of the foundation’s social media offerings. It should come as no surprise that face-to-face marketing builds trust and credibility, which increases the odds of receiving likes and follows on your social media platforms. Meeting individuals in person allows them to put a face to your Facebook or Twitter name, strengthening the connection they have with you and your brand. Face-to-face engagement gives you the opportunity to address any questions or reservations one may have about your social media offering. This dialogue can transform skeptics into believers, increasing the likelihood of a future social media connection. The engagement team met a number of people at Cycle on Life who were leery of social media and did not have a Facebook or Twitter account. This gave Sherpa’s team a chance to educate individuals on the benefits of staying up-to-date with the organization’s events and published content. Once they began to see the value that the foundation’s social media streams provide they became interested in signing up for an account strictly for the purpose of following RHCF. Sherpa provided the event’s MC with copy describing how to connect with RHCF’s online social channels. This call-to-action was mentioned a number of times throughout the day. The sunglasses giveaway booth provided Sherpa the opportunity to directly engage with every participant in the event. The riders who wore the sunglasses on the ride added impressions and increased exposure for the social media channels. Members of the social media engagement team overheard individuals talking with each other about the sunglasses and the social media channels listed on the frames. Providing a strategic giveaway resulted in valuable peer-to-peer marketing, sparking more discussion about RHCF’s social media platforms. These touch points worked in tandem with the digital billboards advertising the social media accounts on site during the event, and the sending of e-blasts both leading up to, and following Cycle on Life, outlining where to find the foundation online. This multi-pronged approach ensured that the various social media outlets were at the forefront of the minds of those who engaged with the event over a period time, not just on the day of. Sending a social media engagement team to an event has a time and a place and it will not have the same effect in every setting, however, for a not-for-profit fundraiser such as Cycle on Life it was a perfect fit. By giving away sunglasses that had immediate value for cyclists and connecting with individuals from RHCF’s target market in person, we were able to generate interest in Riverview’s social media channels and facilitate engagement on each platform. Most importantly, a face-to-face interaction allowed the social engagement team to gain credibility for RHCF’s channels and immediately address any questions or concerns that individuals had. If you’re interested in learning more about the great work that Riverview Health Centre Foundation does, check out the link below!